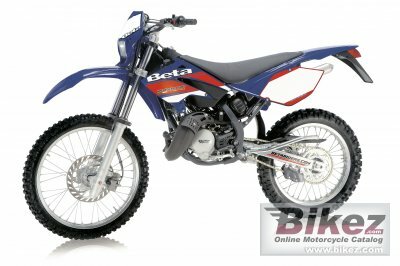 2008 Beta RR 50 Enduro STD euro 2. Picture credits - Beta. Submit more pictures. The brand new RR50 shows off an even more racing and aggressive design, following the RR 4-stroke layout. And it�s not over yet: this model present several innovations such as a new braking system, a new exhaust system, a new digital dashboard and more. Provided by a solid and basic frame, RR 50 surprises for its aggressive and handy attitude. It proves to be a real Enduro in all respects, getting away from the bunch of the anonymous 50cc bikes. The new version is available in a full range of absolutely vivacious colours: an aggressive metal blue, a smart orange/grey and an astonishing flash red. The heart of the RR is an agile single-cylinder 2 strokes, prompt at slow running, brisk and snappy when accelerating, thanks to a well-gauged carburetion highlighting the bike�s power. A charming appearance, handiness and reliability: these are the traits of a bike that doesn�t fear the mud, the dirt-tracks nor any contest with other motorbikes. The tuning-up chances available are absolutely amazing, thanks to the special kit planned out for the vehicles participating to the Italian Enduro Championship. RR 50 is also available in Standard versions: the former with an aluminium frame, the latter moved by the same engine but supplied with a more basic setup, an interesting opportunity for all those pilots who are looking for an urban ride or some off-road skidding instead of a more racing-oriented use. Ask questions Join the 08 Beta RR 50 Enduro STD euro 2 discussion group or the general Beta discussion group. Get a list of related motorbikes before you buy this Beta. Inspect technical data. Look at photos. Read the riders' comments at the bike's discussion group. And check out the moped's reliability, repair costs, etc. Show any 2008 Beta RR 50 Enduro STD euro 2 for sale on our Bikez.biz Motorcycle Classifieds. You can also sign up for e-mail notification when such mopeds are advertised in the future. And advertise your old MC for sale. Our efficient ads are free. You are also welcome to read and submit motorcycle reviews.